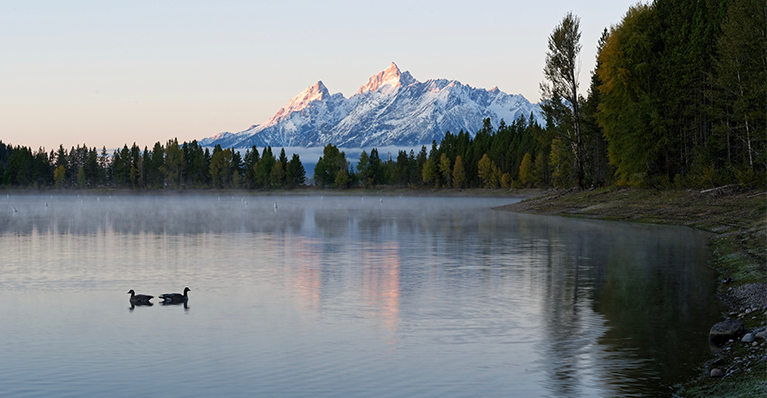 On the eastern side of Jackson Lake in Grand Teton National Park is one of the places we recommend seeing when you’re in the area or staying at Turpin Meadow Ranch. The Colter Bay District provides some of the best wildlife viewing opportunities in the park as well as a wide range of trails and visitor services. Here are a few things for which the Colter Bay area is known. The Colter Bay swim beach is possibly what the bay is best known for. The beach and lake offer stunning views of Mount Moran to the west, or swimmers can also enjoy the seclusion of Two Ocean or Emma Matilda lakes. At the Colter Bay Beaches themselves, amenities include picnic benches, and visitors are known to bring inflatable rafts. All the lakes stay chilly all summer, so prepare accordingly. Water shoes are recommended for the smooth rock and gravel lake bottom. Numerous hiking trails wind along the shores of Jackson, Two Ocean, or Emma Matilda lakes. You might also venture north along the Snake River at Flagg Ranch. There are four nearby trailheads: Hermitage Point, Flagg Ranch, Jackson Lake Lodge and Two Ocean. Afternoon thunderstorms are common and weather may change abruptly, be sure to bring extra clothing and plenty of water. Enjoy some of the world’s best cutthroat trout fishing by either casting a line from shore, or sinking one from a boat in Jackson Lake. Head north a bit for fly fishing from the shores of the Snake River. Be sure to purchase a Wyoming fishing license at local marinas or tackle shops. Canoes at Colter Bay in the Grand Teton National Park. 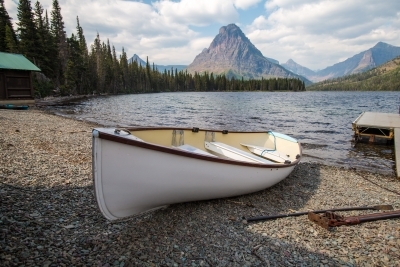 Launch your own boat, or rent a canoe, kayak, or motorboat from the Colter Bay Marina in Jackson Lake. Non-motorized boats can access the Snake River from several boat launches or Two Ocean Lake from the trailhead area. Boat permits are required and may be purchased at the Colter Bay Permits Office. Many animals frequent the Colter Bay area, including moose, bears, wolves, elk, mule deer, and birds such as sandhill cranes, pelicans, and osprey. Be sure to follow safe wildlife viewing practices. Turpin Meadow Ranch is the ideal launching off point for this and many other Wyoming adventures. Your stay with us will include a cozy, luxurious cabin or chalet, a gourmet prairie-to-plate breakfast (ask about lunch and dinner availability too). While we think visitors could easily spend at least a day at Colter Bay alone, browse our website or just ask any staff member for additional suggestions.